eCommerce is a booming business in today’s market. As more and more businesses add the option to purchase products online, consumers are heading online, rather than in-store, to make a transaction. 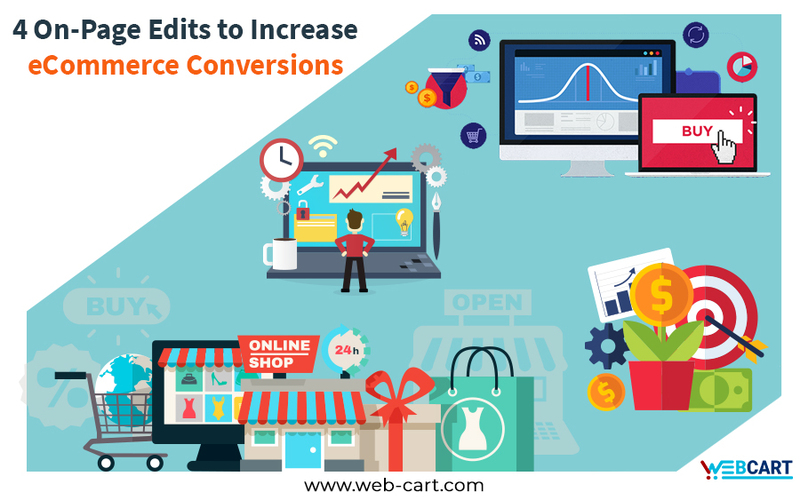 If your eCommerce page is receiving a low conversion rate, then it is time to make some updates. Causes of low conversion rate could be poor page navigation, incorrect filtering, and sorting of a product or inability to find the correct item in a search. When looking to improve your on-page eCommerce conversions keep the following in mind. The customer experience is the most important factor to consider in all the decisions you make when designing a product page. Know what they want when looking at your page. They want to purchase your product. Customers wants an easy transaction. They want to know what other consumers think about your product. If possible, explain or demonstrate what your product does. In a world where people jump from page to page, they might now always know what your product can do for them. Even a simple bullet point explaining how to use the product can help with a conversion to purchase. Go through the customer’s journey yourself. Remember to keep checkout simple with an option for guest log-in. Also, free shipping is a big deal for customers. If you don’t offer it, make sure it’s clear to them prior to checkout. Have chatbot available to answer questions for them, or add in testimonials and reviews from other customers. increases its ranking in search engines, which increases the number of people coming to your website. Look at your analytics too. How are consumers moving through your site and pages? How many are following through on a purchase? Where are they getting hung up in the product purchase? Are consumers leaving your site quickly after landing on it? Not a good sign, a high bounce rate means you’re not giving people what they want upfront or explaining your product well enough. If visitors are jumping around to multiple pages during their visit, that can look good for engagement. However, it can also raise a flag that they don’t have a clear conversion funnel. The design of a page is important to its usability. Have you tested it out on a mobile device? Is your call to actions clearly stated? How fast is your page loading? If any of these pieces aren’t working, it can lead to consumers bouncing off of your page. You may have a lot to say or show about your product, but use that information on your social media pages or elsewhere on your site. Having a mobile-friendly website is quickly becoming the norm for website developers. Consumers are ordering things on the go, and it’s estimated by 2020 than 50% of the market purchasing will be from mobile devices. Placing your CTAs up front and in the face of consumers allows them to know exactly what to do. On the product page itself, have a variety of CTAs, from ‘Add to Cart’ to ‘Learn More,’ but have them prioritized by what you want the user to do. Page speed is another big factor. If your page is loading slowly, don’t expect people to wait around. It can also affect how your page ranks in Google. This infographic outlines a few other ways slow page loading can affect your bottom line. The bottom line is to keep your product page simple. Feature your product, what it does, and what you want the consumer to do next. Don’t get bogged down in all the details. Remember, the more you add to a page, the more it can slow down your load speed or confuse the consumer about what they should do next. You may have a lot to say or show about your product, use that information on your social media pages or elsewhere on your site. Optimizing your eCommerce page is an ongoing process. From updating consumer testimonials to finding new keywords, the page will always be a work in progress. But by staying on top of smaller, easier fixes, your page will be easier for consumers to use in the end. Previous Previous post: Check Out Top 10 Reasons For Keep Your Website Updated!